One of my very favorite personal finance books is FREE on Amazon and Barnes & Noble for a limited time. Author Trent Hamm shares his own personal story with debt and how he escaped the shackles of it. The book is loaded with great ideas to help you get rid of your own debt. Each chapter has an easy to follow punch list of 5 things you can do to work on your finances. The book also delves into the psychology of how you spend your money, questions what things you value and why they’re important to you, and encourages you to set realistic, achievable goals for your future. 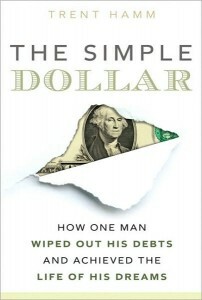 Written in simple, easy-to-to-understand terms and full of sure-to-inspire ideas, The Simple Dollar by Trent Hamm is a must-read for anyone serious about getting out of debt and staying out. Remember, you don’t need to own a Kindle or Nook to take advantage of this book deal! Amazon offers a free Kindle app that will allow you to read Kindle books on your computer or smartphone. If you don’t want to bother installing an app, you can also read books on your web browser with the Kindle Cloud Reader . Barnes and Noble also offers a free Nook app that will allow you to read Nook books on your PC, Mac, iPad, iPhone (or iPod Touch), or Android. Prices can change quickly, so be sure this book is $0.00 when you add it to your cart. Yay! Thanks for this tip – I’ve been meaning to read this book (or rather, finish reading it) for quite some time! Happy to help! Enjoy your reading!